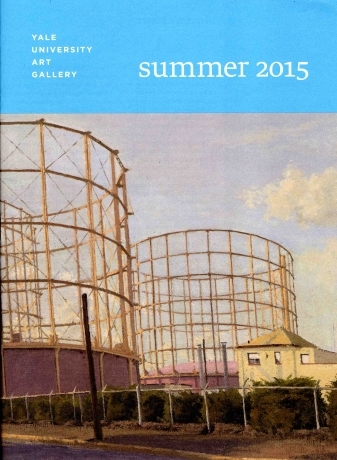 Betty Cuningham Gallery is pleased to announce an exhibition of recent paintings by Rackstraw Downes. The exhibition, the artist’s fourth show at the gallery, will include approximately sixteen paintings dating from 2009 to the present. Downes will be present for an opening reception on October 11, 6-8pm. An illustrated catalogue accompanies this exhibition. Downes paints from observation, creating his paintings on site, from start to finish. 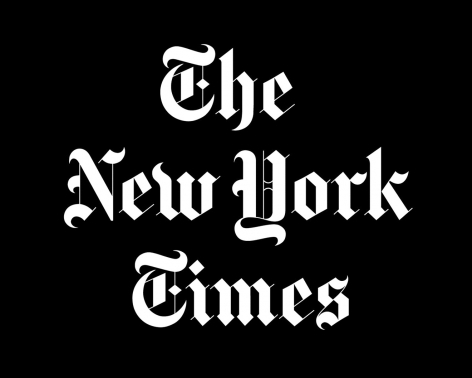 As a consequence Downes moves with the seasons: April through October in New York and November through April in Texas. The paintings in this exhibition are equally divided between the two locations. Downes says he chooses a site because it satisfies a “personal need” or has a kind of magic, but whatever his reasons are, he seems to choose sites that challenge him as a painter and that remain devoid of narrative, rhetoric and cliché. In this exhibition, the chosen locations of his Texas paintings include a graveyard, (as in two paintings titled Remains at the Site of the Old Military Cemetery, Fort D.A. Russell, No. 1 and No. 2), a local, outdoor dance floor (as in Outdoor Dance Floor, Presidio, TX) and simply the vast, expansive sand hills (as in Presidio: In the Sand Hills Looking East with ATV Tracks & Cell Tower and Presidio: In the Sand Hills Looking East with ATV Tracks & Cell Tower). His subject is “as far as the eye can see” (the title given by Rob Storr to an essay in the monograph, Rackstraw Downes, Princeton University Press 2005). Similarly in the New York paintings, Downes goes for the ordinary, rather than the extraordinary, with the same tenacious detail. In the pair of paintings, Under the West Side Highway at 155th Street, Looking South and Sand, Gravel and Mulch: NYC Parks Dept. Facility at 155th Street, Downes captures the largest vista possible: the maximum distance in front of him as well as to either side. His comprehension of space is equal to his attention to time. Downes paints AM paintings or PM paintings, sun paintings or rain paintings always true to a specific light and exact time (e.g. Under an Off-Ramp from the George Washington Bridge). 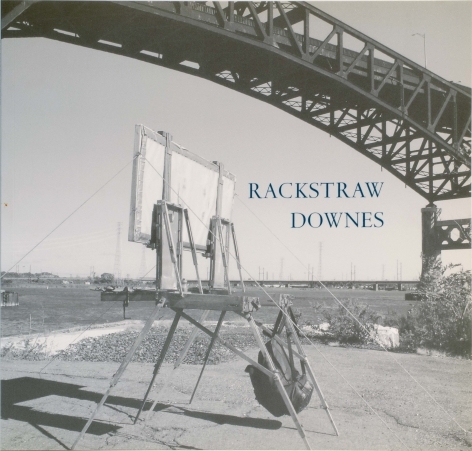 Rackstraw Downes was born in Kent, England. He received a BA from the University of Cambridge in 1961. 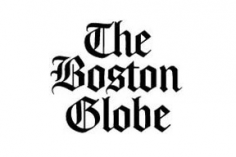 He has lived and worked in America since taking citizenship in 1980. He received both a B.F.A. (1963) and a M.F.A. (1964) from Yale University. Over the course of his career, he has been the recipient of numerous awards and recognitions, most notably the John D. and Catherine T. MacArthur Foundation Fellowship in 2009 and the John Simon Guggenheim Memorial Fellowship in 1998. In 1999 he was inducted into the American Academy of Arts and Letters. 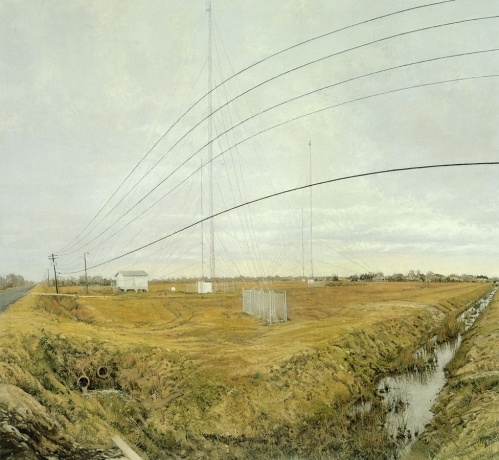 In 2010, The Parrish Art Museum, Southampton, NY, originated the retrospective, “Rackstraw Downes: Onsite Paintings, 1972 – 2008” which travelled to the Portland Museum of Art, Portland, ME, and the Weatherspoon Art Museum, Greensboro, NC. 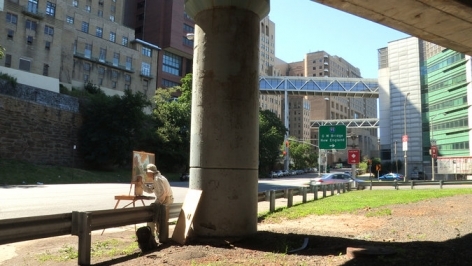 In addition, The Aldrich Contemporary Art Museum, Ridgefield, CT, hosted a process show, “Rackstraw Downes: Under the Westside Highway” which included paintings, drawings, sketches, and diaries for this one site. In 2012 he was a featured artist on the PBS program, ART 21. His work is in the permanent collections of The Art Institute of Chicago, The Museum of Modern Art, The Metropolitan Museum of Art, the Whitney Museum of American Art, The Museum of Fine Arts, Houston and the National Gallery of Art, among others. 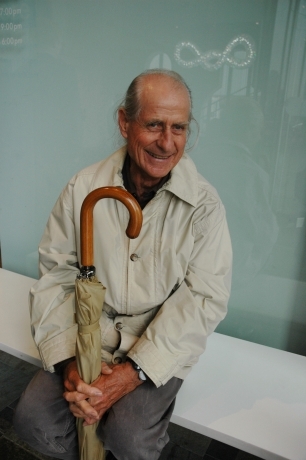 His essays have appeared in The New York Times Book Review, Art in America and Art Journal. Downes delivered the Ninth Annual Raymond Lecture for the Archives of American Art in 2009, and in 2011, participated in a Wyeth Foundation for American Art conference at the National Gallery of Art, entitled Landscape in American Art, 1940-2000. 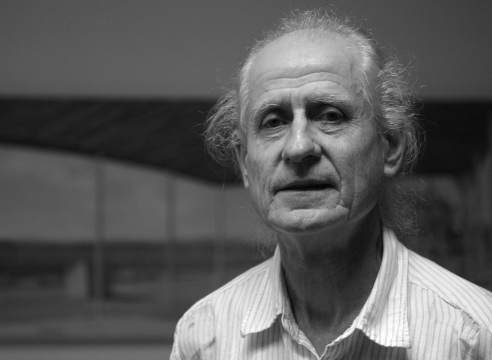 Downes lives and works in New York City and Presidio, TX. The exhibition has been extended through December 22, 2012.